High temperature (cone 10) kiln wash available by the pound. Kiln wash is applied to kiln shelves to protect them from glaze drips. On a washed shelf, drips can be easily removed without gouging, grinding or marring the kiln shelf. Apply only one coat at a time. 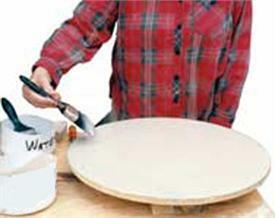 Use a wide paintbrush or utility brush (a 2" - 3" wide, soft bristle brush generally works best). Two or three individually fired-on coats of kiln wash are preferable. You may fire bisque or unglazed ware for the first two firings, but your shelves will not be completely protected against glaze drips until 3 coats have been applied. When you're applying kiln wash to your shelves for the first time, it helps to dampen the top of your shelves with a wet sponge or a water-filled spray bottle first. This makes the kiln wash go on easier and more evenly. Only apply to the tops of kiln shelves. We strongly discourage applying kiln wash to both sides of your shelf. If you do, please know you must carefully check each shelf when loading to prevent kiln wash from flaking off and dropping onto your ware. If you notice that your kiln wash is flaking off, use a paint scraper (or something similar) to remove any loose bits, then reapply kiln wash. If glaze drips onto your shelf, use the paint scraper to pop the glaze drip off and clean up any loose areas around the area, then dab some more kiln wash in the bare area. WHERE NOT TO USE: Again, we suggest you DO NOT put kiln wash on the bottoms of shelves, the bottom of the kiln or the sides of the kiln. Also - be sure to vacuum your kiln out to get loose kiln wash out of the kiln if it flakes off or into the element grooves.